represents the hyperplane with normal n passing through the point p.
represents the hyperplane with normal n given by the points that satisfy . 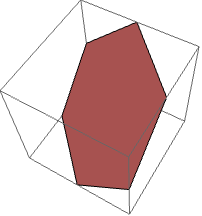 Hyperplane can be used as a geometric region and a graphics primitive. Hyperplane[n] is equivalent to Hyperplane[n,0], a hyperplane through the origin. Hyperplane corresponds to an infinite line in and an infinite plane in . Hyperplane represents the set or . 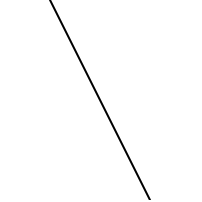 Hyperplane is defined for n∈d, p∈d, and c∈. Hyperplane can be used in Graphics and Graphics3D. Hyperplane will be clipped by PlotRange when rendering. Graphics rendering is affected by directives such as Thickness, Dashing, Opacity, and color. Graphics3D rendering is affected by directives such as Opacity and color. FaceForm[front,back] can be used to specify different styles for the front and back, where front is defined to be in the direction of the normal n.